Particularly in the automotive world, people tend to look back through the history of cars. Many automotive museums display restored cars of the past. Huge auctions attract thousands of buyers for the “classic” cars they are auctioning off for outrageous sums of money. Many of us know that feeling of driving an old car is unique and special. The world of Motorsports has been celebrating its past for many decades. 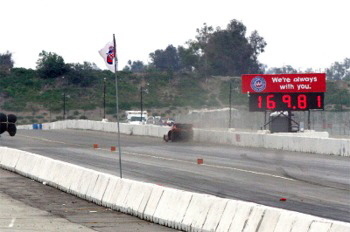 Most, if not all, of todays car racing comes from the California dry lakes racing begun in the early ‘30’s. Many “Motorsports” museums around the country show the history of various types of race cars. 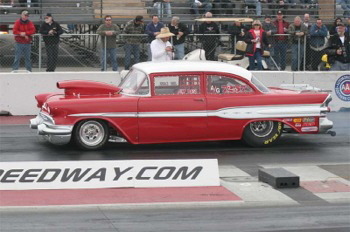 About twenty years ago racers thought it would be cool to take museum race cars and exhibit them on the drag strip. 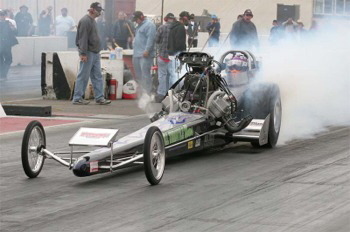 Without proper safety equipment, that practice evolved into nostalgic looking dragsters with current chassis and safety features. 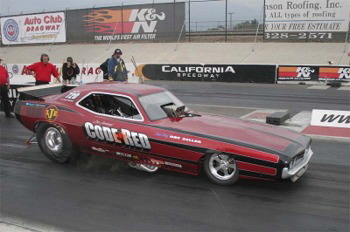 These racers created clubs or associations that established rules. 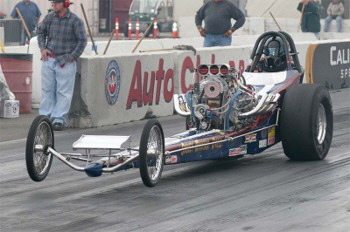 Currently the rules for a nostalgia Top Fuel Dragster require a “front motor” design and generally follow those rules the NHRA had in place in mid-‘60’s. 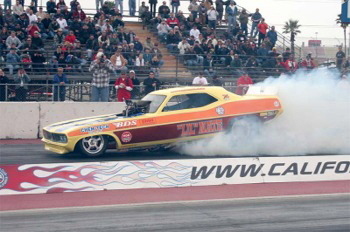 The nostalgia Top Fuel Funny Car began its rise to popularity about 10 years ago. The body styles are restricted roughly to those of the years ’69 through ’78. 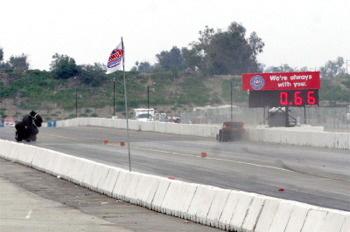 On April 21, ’07, the first Nostalgia Nitro Shootout was held at the Auto Club Dragway at California Speedway Fontana, California. 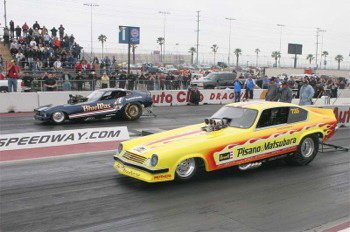 Over 2000 spectators tuned out to see the “Featured” classes which included 13 in Nostalgia Top Fuel Funny Car, 5 in Nostalgia Top Fuel Dragster, and 23 in Nostalgia Eliminator. Another approximately 65 nostalgia cars rounded out the event. 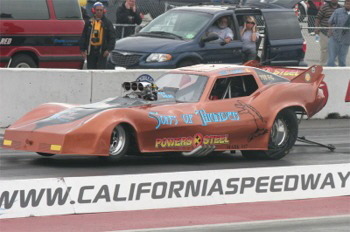 Some of the Funny Cars onhand included Mike Adams – “Sons of Thunder”, Lee Paul Jennings – “Code Red”, Steve Romanazzi - “Warrior”, Nate Bugg - “Lil Nate”, Jeff Utterback – “Pisanno & Matsubara”, Jim Holtz – “Predator”, Mike Savage – “Speed Sport”, Terry Capp – “Bubble-up”, Del Worsham – “Blue Max”, Bob Godfrey – “Oblivion Express”, John Powers III - “Powers Steel”, The races were run “Chicago Style” meaning the two lowest ET’s after two qualifying rounds meet in the Final for that class. 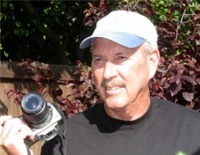 The Final in the 23 car field for Nostalgia Eliminator was between Dale Shubert and Don Taros, the winner was Don Taros. 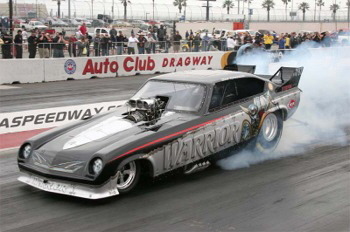 The Final in the 13 car field for Nostalgia Top Fuel Funny Car was between Lee Paul Jennings driving “Code Red” and Steve Romanazzi driving “Warrior”. 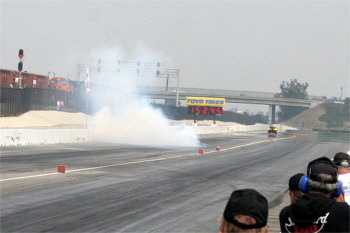 “Warrior” was unable to backup after his burn out, “Code Red” made a single pass and was awarded the win. 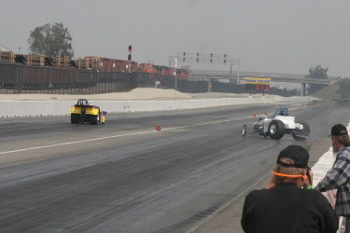 The Final in the 5 car field for Nostalgia Top Fuel Dragster was between Rick White and Adam Sorokin. 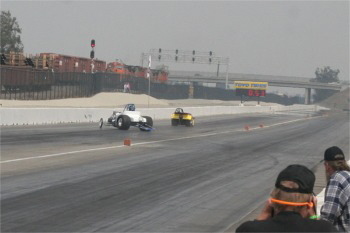 This race was very close the “margin of victory for Rick White was less then two feet! 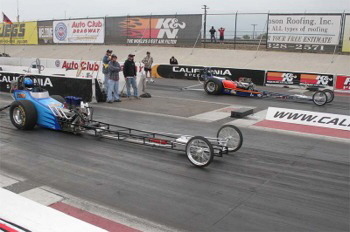 The legendary “Winged Express” with Mike Boyd driving made a strong exhibition pass. Judging from the comments I heard, this won’t be the last Nostalgia Nitro Nationals! Thanks for the Show! 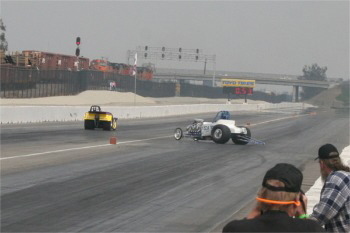 The legendary “Winged Express” with Mike Boyd driving made a strong pass. 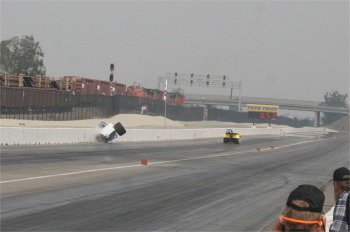 Bobby Lee driving “Soul Train” (near lane) begins an unfortunate run. 0020, 0022, 0025, 0026, 0028, 0030, 0034, 0037 – At about 100 feet from the start line, his car unexpectedly swerves to the left. 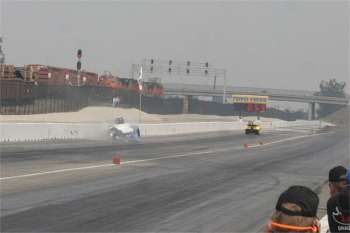 His car is heading for the other car in the left lane as Bobby tries to get control. 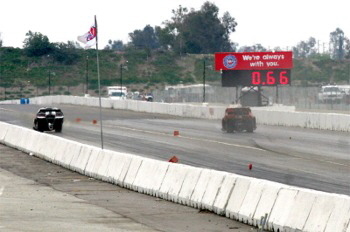 At about 80 mph, he misses the other car but hits the left wall. 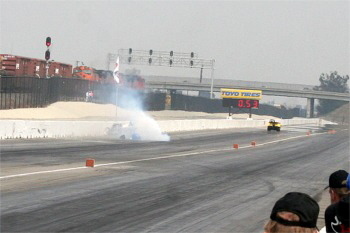 The impact causes the throttle to open and the tires begin to spin causing a lot of tire smoke. After the throttle shuts off, the “debris” that was once was a nice car, lays in the middle of the track. Bobby walked away unhurt. 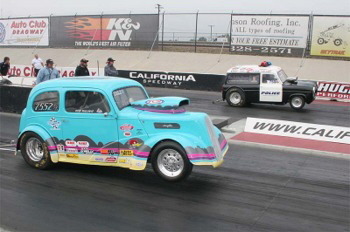 Officer Tom Gibby (far lane) in his “Paddy Wagon” and Bob Williams in his ’48 Anglia make a side by side run. 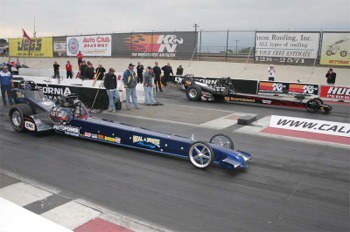 The Top Fuel Funny Cars pose for their pictures. 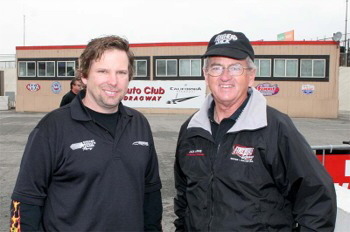 NHRA Funny Car driver Del Worsham with Nostalgia Top Fuel Champ Jack “The Sheriff” Harris. 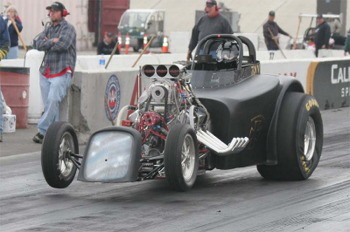 Jordan Frolfa lifts the wheels as he launches his Nostalgia Eliminator dragster. 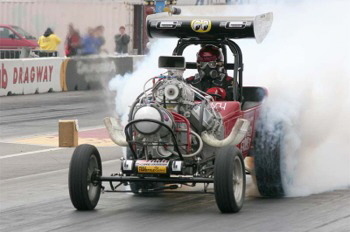 James Valencia’s altered “pulls the wheels”. Some other cars out for the show. 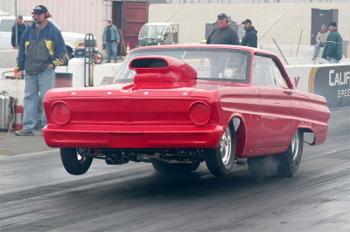 A nice little ’65 Ford Falcon Gasser shows his muscle on the start line. Jim Data brought his A/gas Pontiac out to play. 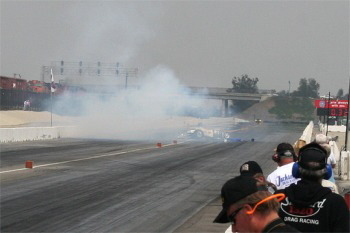 In the Funny Car final Steve Romanazzi driving “Warrior” was unable to backup after his burn out. 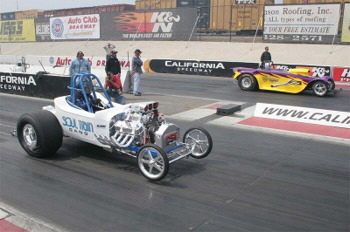 “Bubble Up” is another Funny Car recreation of a famous Funny Car of the passed. 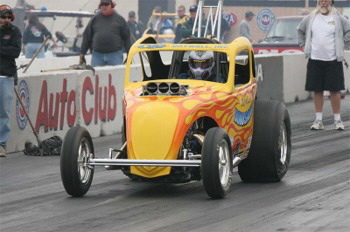 “Bubble Up” is driven by Terry Capp. 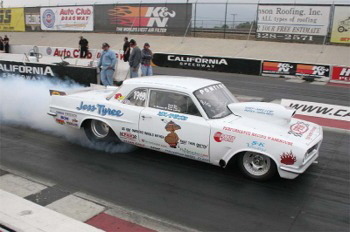 Jess Tyree “heats the hides” of his B/gas Pontiac. 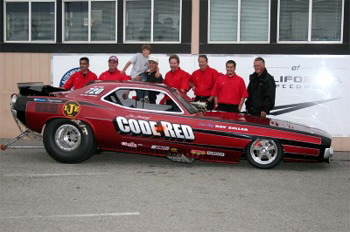 Lee Paul Jennings and the “Code Red” team in the Winners Circle. 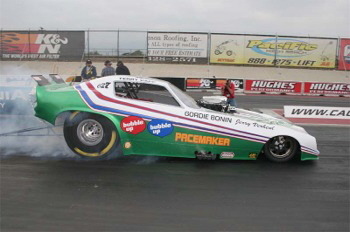 - Mike Adams driving “Sons of Thunder” Funny Car “rubs” the wall as he goes through the lights at 170 mph! 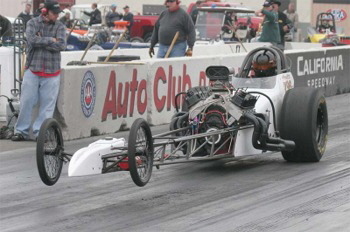 Looks like he’ll need a new set of right side headers!